New entrant INQ has since brought to market a low-cost handset that many have dubbed ‘the Facebook phone‘ as it tightly integrates the social network into the device’s messaging and contacts application. Similarly, Blackberry recently beefed ups its own Facebook application, while Palm’s betting much of its comeback on the Palm Pre’s “synergy” feature, which sees Facebook and other third-party web services become an integral part of the phone’s functionality. 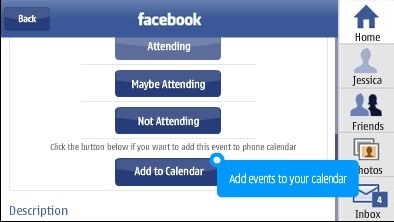 On that note, with just a few weeks before the N97 is set to debut, Nokia have published an interactive demo of the phone’s User Interface, including a walk-through of some of the features of the included Facebook application. Screen shots and comments below. You can both update your status and view your friends’ status updates/news feed. 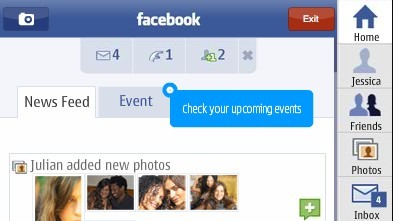 Judging by the icons a the top of the screen, you can also see any messages in your Facebook Inbox, as well as friend requests and ‘pokes’. You can upload a photo to Facebook either via the N97’s camera or from a photo already stored in the phone’s image library. Additionally, you can give the photo tags, a title and choose which of your Facebook photo albums to publish it to. You can also view any of your friends’ photo albums. 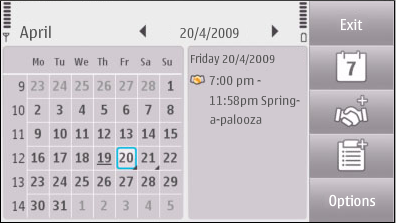 You can play with the interactive demo of the Nokia N97’s User Interface here. WOW awesome app thank's for the info!